Beuchat Mundial Elaskin 5.5 mm Complete: New suits conceived and made in very flexible material (Elaskin) in order to fit every fishermen and ease the wearing of the suit. - Preformed beaver tail with plastic clips. - No seams in the -joint-areas- to assure best possible comfort (armpits, shoulders, inside of the knees and elbows). - Outside Nylon Jersey / Inside Neoprene open cell Titanium. - Reinforced chest piece (Supratex). - Wrists and ankles seals with E.W.S (Easy Wave System). 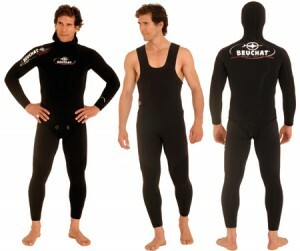 Click the button below to add the Beuchat Mundial Elaskin 5mm Wetsuit to your wish list.